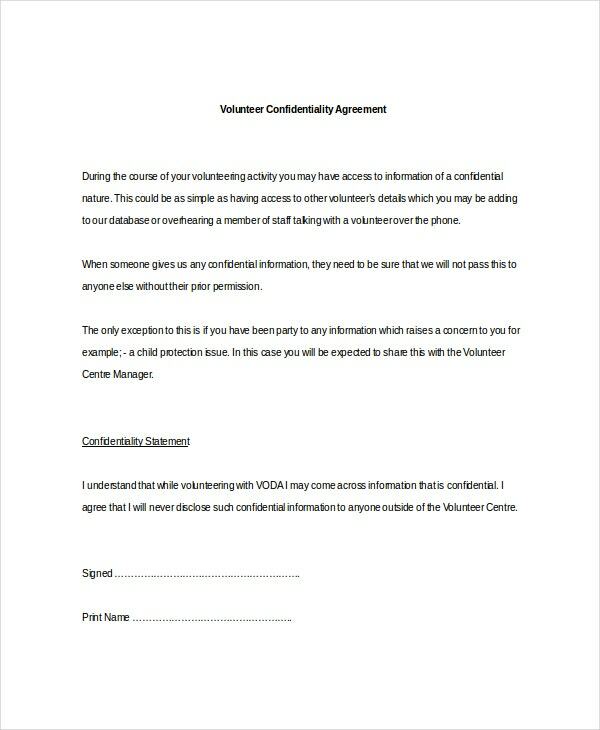 Volunteer confidentiality agreement is a mutual obligation which is performed between two or more parties for non-disclosure of any contractual information, whether it is in computer tapes, writing, visual, electronic media or even otherwise. If you have accomplished any work which contains sensitive or crucial nature of information, this agreement can be useful for your specific project or programs to protect its privy. Moreover, the disclosure of any information can be the reason of criminal penalties as it is a violation of the law and regulations of the agreement. You can also see Rental Agreement Templates. 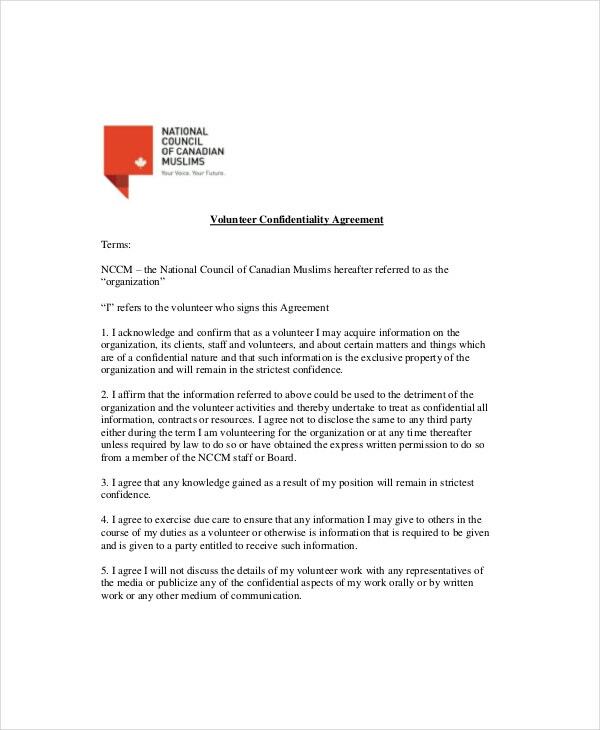 Many a time, only one party is bind to safeguard the specific data as well as any other vital information of the agreement, which represents the particular word unilateral volunteer confidential agreement. Basically, this act is performed to obtain a potential relationship between the parties which prevent to access the information of the agreement to the other parties. Basically, a mutual volunteer confidentiality agreement sustains an obligatory link between two or more parties in which both the parties are conscientious for its necessity of privy for the protection of victims, whether it is for any specific function or even otherwise. Any type of modification in statements is not valid unless it is done through a mutual agreement between the authorized representatives. Medical volunteer confidentiality agreement is performed to preserve or safeguard any medical or personal confidential information of patients, employees or any other business activities, which is essential for them. If any inappropriate access is made, then some penalties can be imposed by the peccant person. In this blood-thirsty arena of business, only one who keeps their secrets confidential can get better winnings in this competitive market. 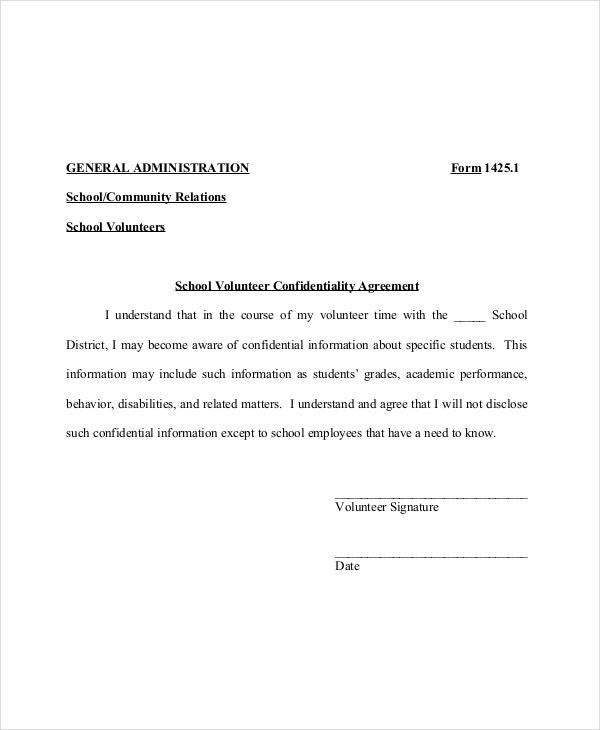 Business volunteer confidentiality agreement helps you to preserve any technical information or business deal, from which you can do your work freely without fear of deceiving. 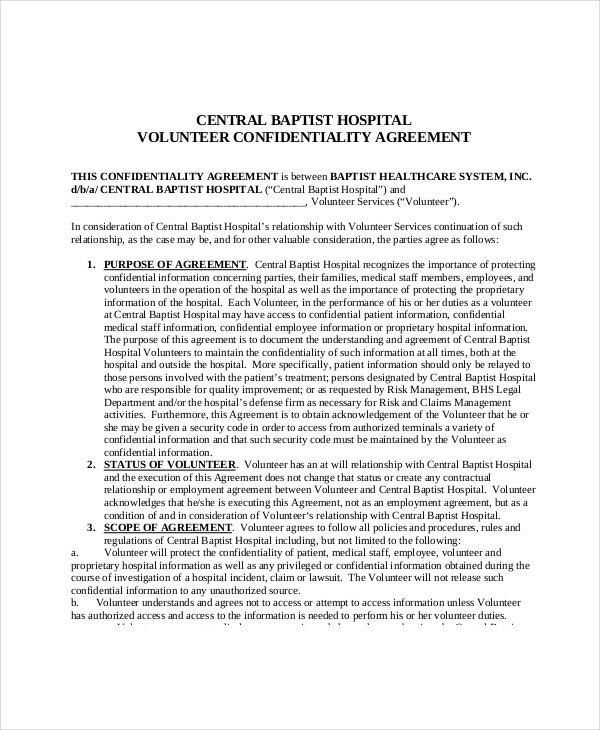 Generic volunteer confidentiality agreement is a very general obligation to preserve any needy information or statement which is described in this agreement. This agreement works for both the parties in the same area of responsibility. 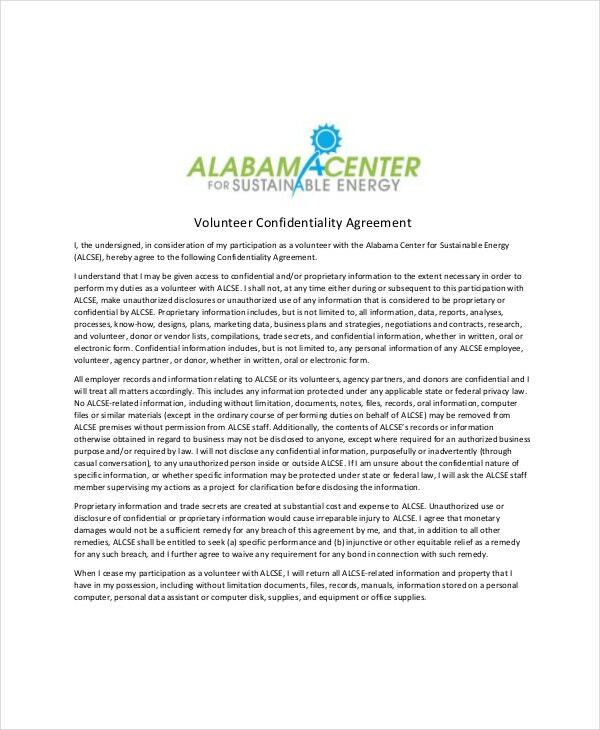 What is originally meant by volunteer confidentiality agreement? 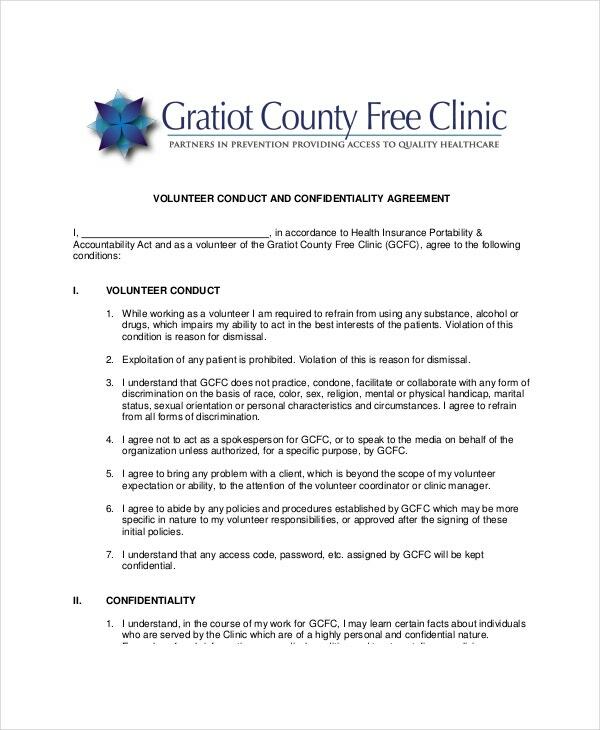 Volunteer confidentiality agreement is a way to preserve information or any crucial activities between two or more parties which are voluntarily agreed to sustain its privy. Make obligation to maintain the secrecy of crucial and sensitive information is the primary target to design this kind of agreement. 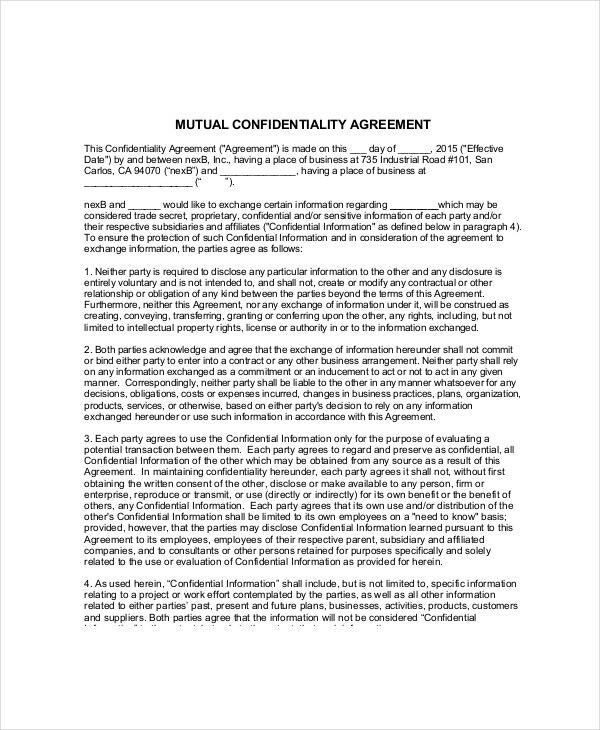 You can also Basic Confidentiality Agreement. What points should be specifically considered while designing a volunteer confidentiality agreement? It should be well-mentioned in the agreement that when and how the personal information of the agreement can be accessed. Management of records should be also mentioned to ensure that the records are reliable and are under safeguard. Privacy legislation is required during the collection of information and keeping record properly. 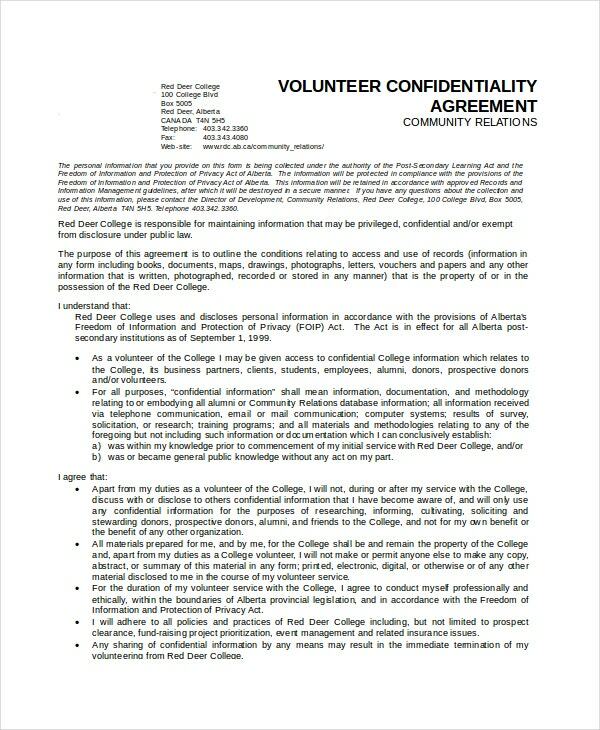 Volunteer confidentiality agreement is the best way to uphold the intelligibility as well as boosting the faith between two or more parties. 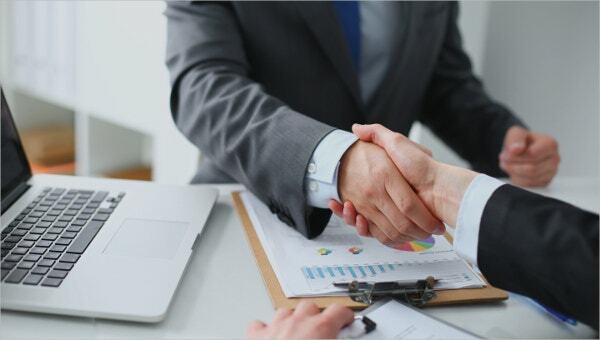 This agreement comes with a huge arena of confidential requirements which can be easily covered under its statement. In the case of breach of any statement or sensitive information, this agreement gives a trouble-free way to resolve the circumstances. Conclusion: We are presenting plenty of volunteer confidentially agreement forms which are easy to download as well as access. Moreover, we are presenting the agreement form which is available in both manners so that one can access it either through a word documents or PDF file. The specialty of the form is that it contains customer-friendly language and covers all the essential clauses of an Agreement Templates. It can be operated in all software with easy printout facility.